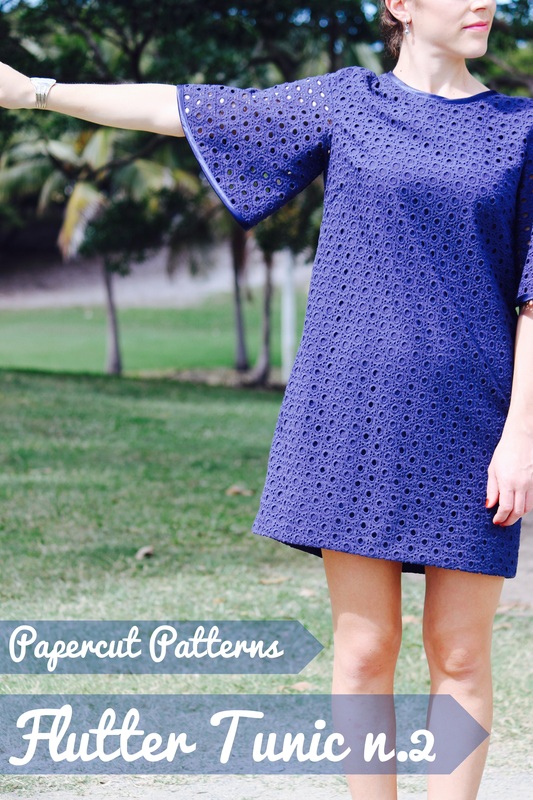 Yet another Papercut Flutter Tunic! Happy weekend everybody! How was your sewing week? Mine pretty good, so good in fact I’ve made another Flutter Tunic! You’re probably sick of reading about this pattern, but the truth is I really like it, so it probably won’t be the last one you see either. The inspiration for this dress came from a Modcloth photo posted on Instagram. It featured a girl with long brown hair wearing a super cute shift dress, in a gorgeous cobalt blue floral sheer fabric, with bell sleeves (you can buy the dress here). Can you see how similar is to the Flutter? I really wanted to find a nice burnout fabric, but I ended up opting for a more casual eyelet cotton. Obviously, the tunic had to be cobalt blue, like the one sold at Modcloth, so I bought some dye and tried to get the same color. Guess what? It didn’t work, it didn’t work at all! What I got instead was a horrible faded looking lilac, so horrible I had to fix it somehow. Fellow sewers and instagramers came to the rescue and after a couple of days spent whining and thinking, I threw the fabric back into the dye pot. This second time I’ve used navy dye and the result is well away from my inspiration color, but at least it’s wearable. It’s not pure navy and it still has a subtle purple tint, but it’s dark enough and I quite like it. Luckily, I was able to find just the right color for the lining and bias binding, so from the dyeing session on, everything else was certainly downhill. I decided to underline the front and back pieces, firstly for modesty, but also to hide most of the seam allowances and the darts too. I left the sleeves unlined instead, to highlight the pick-a-boo effect of this cotton fabric. I love the effect. To underline this Flutter, I’ve hand basted the underlining pieces to the shell fabric ones, all cut from the same pattern pieces, and then followed the pattern instructions and constructed the dress treating the two layers as one. I’ve used the overlocker to finish every seam and bias binding for every edge – neck, arms and hem. The hem has been stitched to the underling by hand to avoid any visible stitching line from the right side. I chose to use bias binding because this eyelet has pretty big holes and a regular hem wouldn’t have looked great on this fabric. Plus, I really like how the bias enhances the shape of the sleeves and also create a clean edge, so I’ll probably stick with this finish when I make another Flutter. For this third version, I’ve modified the pattern a bit further. On top of the previous few alterations, I’ve done a round back adjustment too and lengthened the dress by 1″. From the photos at the blouse, I’ve noticed I needed some more room in my upper back area, so I tried to alter the pattern for a round back. The main reason I went for this alteration is because there was some pulling towards the center back, which I thought to solve by ‘dropping’ the center back itself. The alteration created a slight curved V neckline, which I didn’t straighten up, to better follow my (bad) back shape. I’m not quite sure this is the right way to address the issue, but I think the back looks better now, what do you think? Should I have increased the prominent shoulder alteration and left out the round back adjustment instead? I really wish I didn’t need any of this, but on the other side, I’m kind of having fun sorting things out and learning how to fit my figure. Certainly, the drive to the botanic gardens, even if short, didn’t help with the look of the back, bloody wrinkles! I’m very happy with how this dress turned out – first of all I love the fabric and, even if the color isn’t exactly what I wanted it to be, I think it will be easier to mix it with the rest of my wardrobe. Secondly, as you may know by now, the pattern! Let me tell you, it’s a very easy pattern, but what makes it special is that you can use many different fabrics for as many different results. If you chose medium/heavy weigh material you’ll get a shift dress with well defined shape and bell sleeves, while a softer fabric will give you a more romantic and floaty garment. Endless possibilities, that’s what makes the Flutter so unique and I reckon the name Chameleon really suits the latest Papercut collection. Lastly, I love this dress because it reminds of one my Nana made for my mum, back in the early 60s. It’s basically a shift dress with boat neck and cap sleeves, in a gorgeous forest green guipure lace. It’s way more elegant than my navy version, but because of that I never wear it – and also because I don’t want to ruin it! My cotton Flutter is a good alternative and I’m sure I’ll wear it heaps. Fingers crossed, it’s not gonna fade any time soon! That’s all from me, have a lovely weekend everyone! I’ll spend mine sewing my last Australian project and after that one, it will be time to pack my sewing stuff and send it back to Italy. I hate packing, but can’t wait to finally have a room all for myself and my sewing machine! Ciao for now! This is stunning, love how you have left the eyelets to show on the sleeves. So airy and light. Keep going can’t wait to see what you do with this pattern next. Thank you! I really wanted the sleeves to be the highlight and I’m happy I went for no lining there. I love how they create shadows on my arms when the sun hits them…. I completely love this!!! Absolutely gorgeous. Did I miss that you’re moving back to Italy? If so, best wishes for a smooth move! 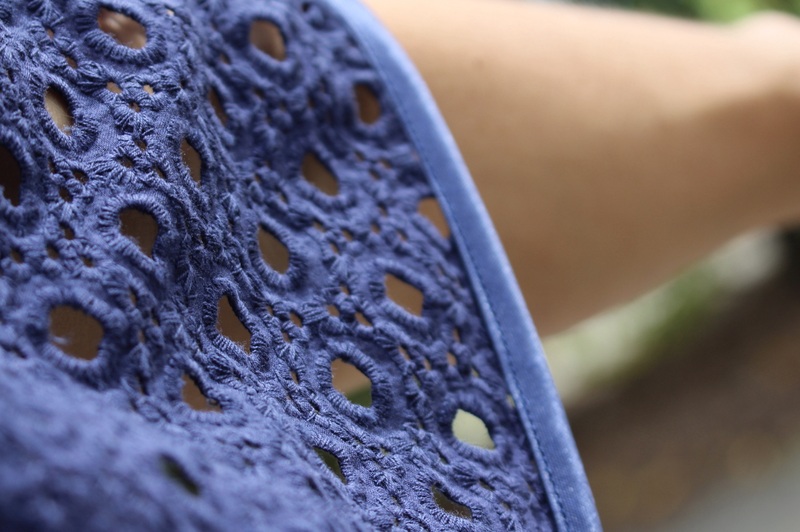 I love the eyelet fabric! I am seriously tempted by this pattern! Thank you Andrea! This pattern is awesome, give it a go! !